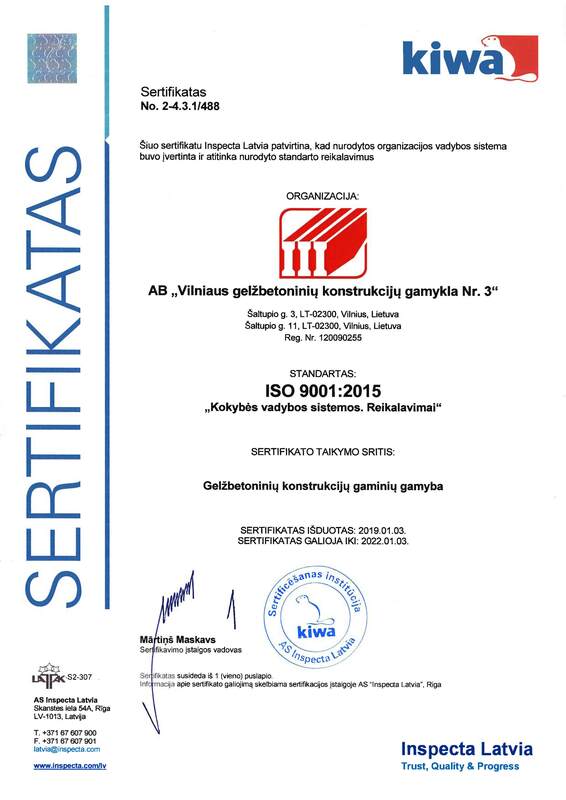 Elements for landscaping – AB "Vilniaus Gelžbetoninių Konstrukcijų Gamykla Nr. 3"
Paving blocks and sidewalk tiles are produced using “Hess” press made in Germany. Sidewalk tiles and blocks are used for pavement of sidewalks, car parks, pedestrian and bicycle paths, and areas surrounding structure walls. The blocks can be used for staircases and supporting plates. Mark (type) Dimensions, mm No. of pcs. The purpose of GB curbstones is separation of the roadway from the sidewalk or lawn. Mark (type) Dimensions, mm Qty of pcs. Only natural materials are used in the production of concrete elements for landscaping. 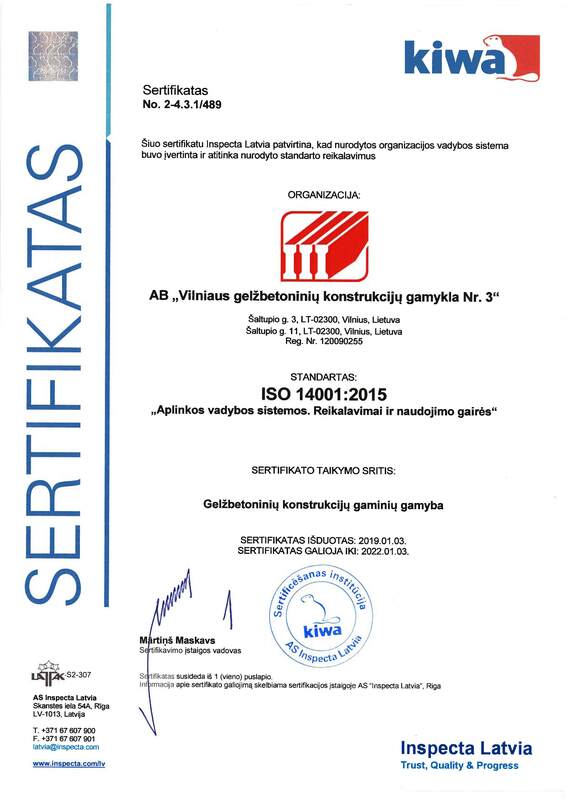 All raw materials used in our company are certified. German inorganic pigments are used in production of colored products. The elements for landscaping are produced from one layer using vibropressing process. conditions. According to the Lithuanian standards in force, shade differences are not considered significant. The color and texture of the items are not adjusted to regulatory specifications. Due to various factors white spots may appear on concrete items. Lime efflorescence can occur when the hardening of the cement results in the release of “free” lime that dissolves in the water contained in the mixture or being exposed to the rain during storage. Lime appearing on the surface of items reacts with airborne carbon dioxide and turns into insoluble calcium carbonate. White spots gradually disappear under the influence of environmental factors. The resulting white spots can be removed with REBAnit-S or CRETEX-100 liquid cleaners. Stain cleaners are to be used strictly according to the instructions. At the end of the procedure, the items should be washed with plenty of water. Lime efflorescence has no effect to the quality of elements for landscaping and can not be the cause for claiming. This feature is permissible according to the standards in force: LST EN 1338; LST EN 1339; LST EN 1340. There is a trend in Lithuania to strengthen the requirements applied to the surface of elements for landscaping. However, an extremely smooth surface impairs the strength, abrasive wear, durability of the items. When the top layer has a coarser aggregate, it gets rougher and improves the performance of the product.